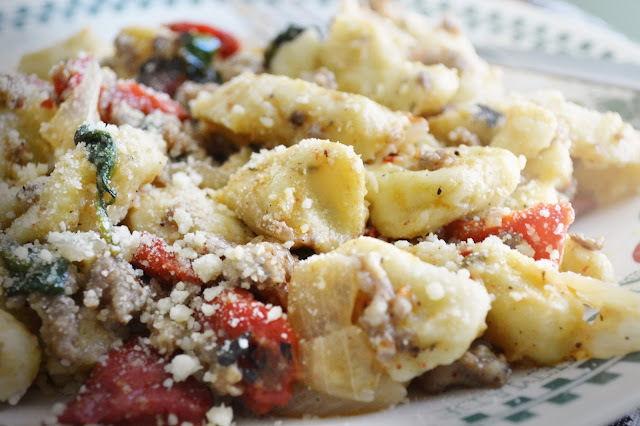 Gnocchi shouldn't be complicated. Sometimes the simplest foods are the tastiest. 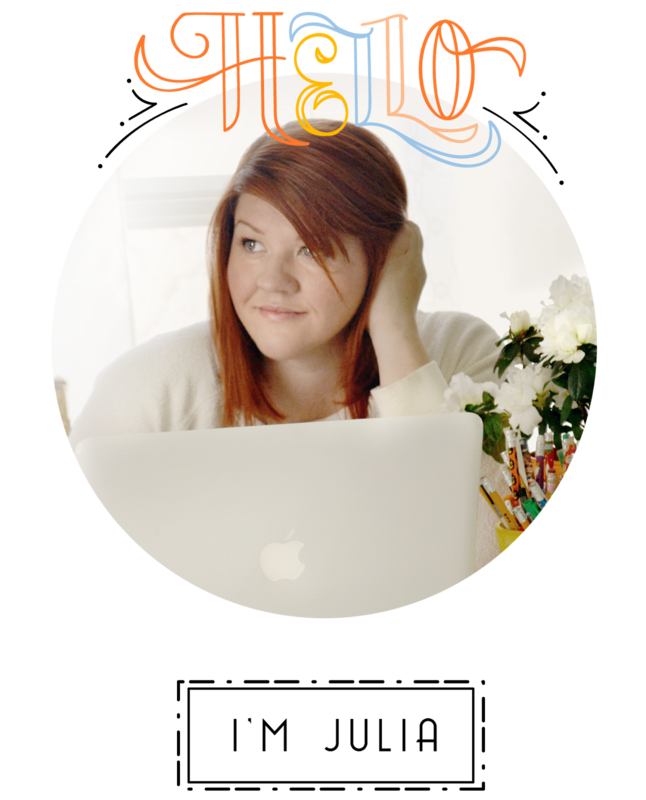 Just like being able to over design artwork you can over ingredient a recipe. No need to get fancy with this little dumpling, its better simplified. This homemade gnocchi dough recipe is the best and its also simple. You can dress it up with your favorite sauce and topping if you like. 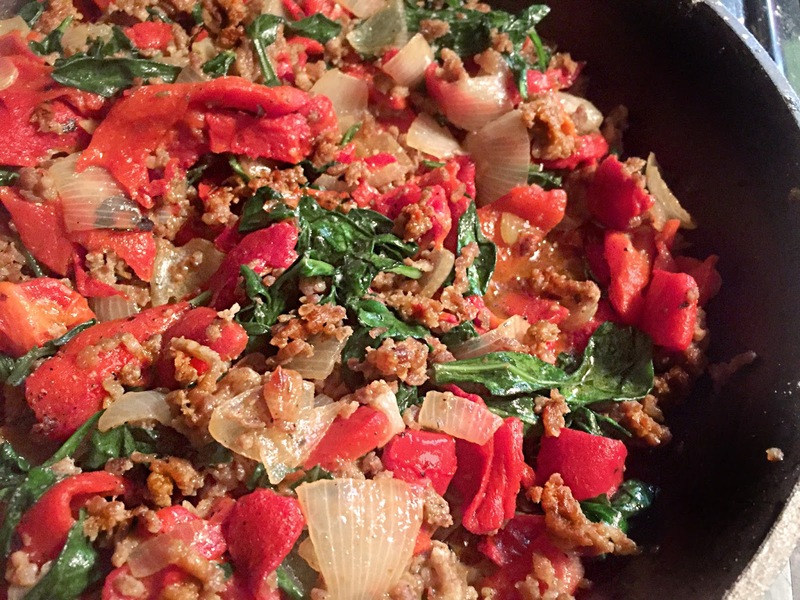 One of my favorite ways to top off this dish is with this Italian sausage and red pepper sauce. It brings this whole dish to life. 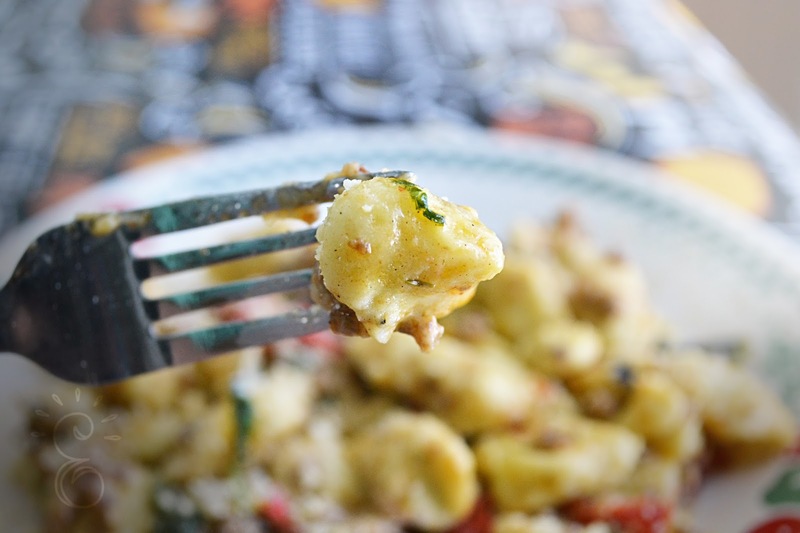 Potato Gnocchi is a soft pasta especially in dough form. 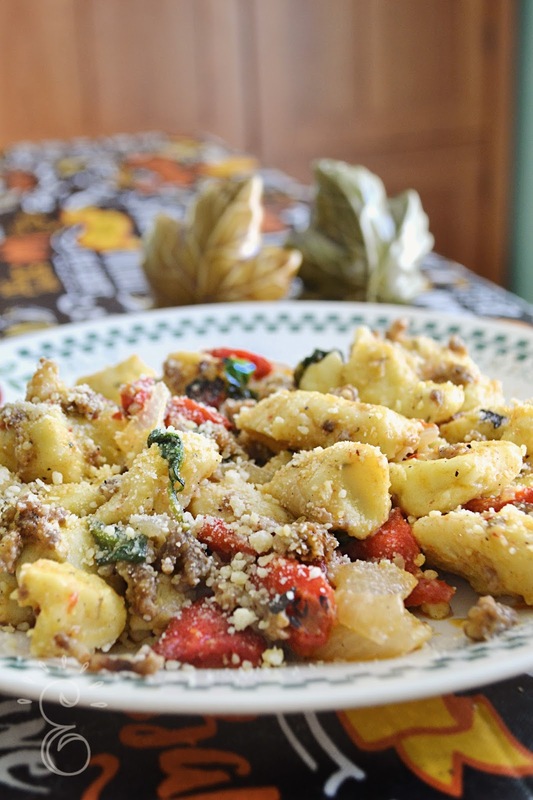 They have a delicious taste and texture that if done right taste even better than traditional pasta. Its does firm up quite a bit when cooked and even firmer if you let them dry out for a few minutes after boiling. They also naturally firm up if you cook them the day before and heat up for your pasta dish the next day. Above is my handsome ten year old helper. 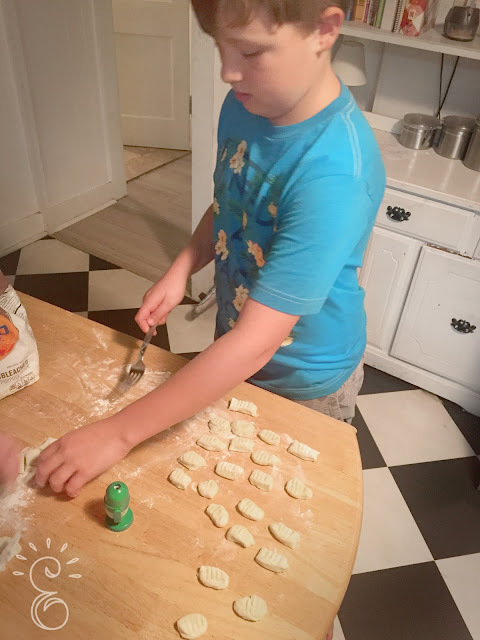 He made sure all the gnocchi had pretty little fork marks on top. I always have my kids with me in the kitchen. The best way to teach kids how to cook is to have them cook with you. It may take a little longer but I am teaching my kids important life skills that will last forever, plus I have the added bonus of making memories with them at the same time. Boil Whole potatoes until soft. Then run potatoes under cold water in a strainer until cooled down. Then peel skin off potatoes. Mash Potatoes until creamy. Add Mashed potatoes, flour, eggs, olive oil, and salt in bowl. Mix until it becomes dough. 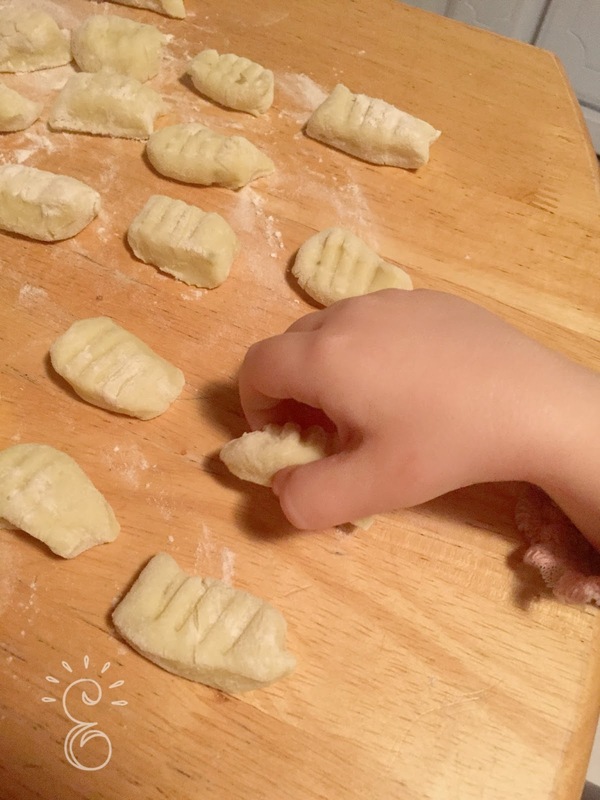 So dough is very soft and you will need to use flour to dust your hands and table to make the gnocchi balls. Take a hand full of dough and roll it out into a 1/2 inch thick rope/roll. Cut dough roll into 1 inch long dumplings. Repeat until all the dough is cut. Make sure you do not touch dough balls to each other or they will stick. Dust the dough balls with with enough flour to prevent sticking. TIP: You can add little marks to the top by pressing a fork gently on top of the gnocchi dough balls. Once all dough is cut. 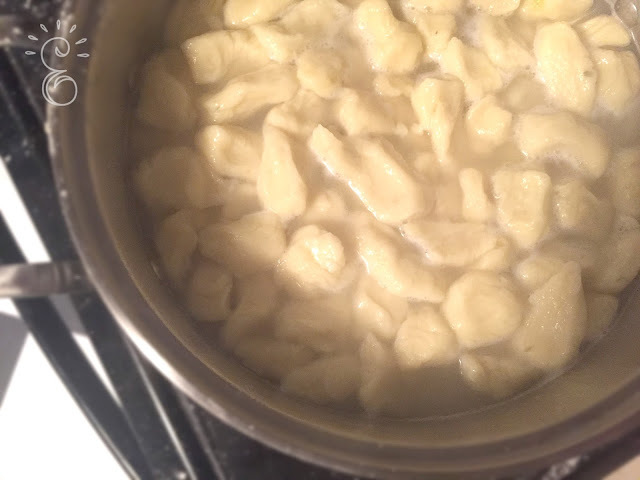 You can add the gnocchi dough to a large pot of boiling water. Boil for about 10 minutes or until all the gnocchi has floated to the top. Gently strain water and serve. TIP: These are even better if you make ahead so they have a few hours to firm up. Reheat them in the oven or microwave. My sweet two year old wants to help as well. I let her place the gnocchi on a plate before we put them in the pot of boiling water. 1. In a large skillet brown sausage and onions. 2. Once meat is cooked add large chopped red peppers. 3. Remove skillet mixture from heat and add chopped spinach. Toss/stir meat mixture until spinach is wilted. Ready to serve over prepared gnocchi. Top with parmesan cheese. Please share below pint rest friendly image for this recipe with your friends and family. Please let me know how you like this dish. Enjoy!